Ericsson today released the latest progress and accomplishments with its trans-Australian network deployment with Telstra – including a new GUINNESS WORLD RECORDS™ title for the longest un-regenerated terrestrial fibre optic link – with Ciena’s WaveLogic 3 coherent chipset playing a big part in the news. Click through for all the details. Ericsson today released the latest progress and accomplishments with its trans-Australian network deployment with Telstra – including a new GUINNESS WORLD RECORDS™ title for the longest un-regenerated terrestrial fibre optic link – with Ciena’s WaveLogic 3 coherent chipset playing a big part in the news. As you may remember, last year Ericsson announced a national network agreement with Telstra, Australia’s largest telecommunications provider, to be its strategic supplier of next-generation optical equipment. That news marked the first public customer resulting from Ciena and Ericsson’s strategic agreement through which Ericsson now resells Ciena optical solutions to its customers. Today’s news details several impressive achievements in the deployment, including a world’s first 10,358 km un-regenerated terrestrial optical transport link between Melbourne, Sydney and Perth, certified by Guinness World Records. While the GUINNESS WORLD RECORDS title is impressive, what comes with this optical transport link are the important benefits of low-latency and resiliency/restoration. By not having intermediary optical and data regeneration, cost and latency performance is optimized. It’s like an airline passenger having a non-stop long distance flight – time is not wasted without any additional cost, Ericsson said in today’s press release. In addition to the transmission distance GUINNESS WORLD RECORDS title, Ericsson and Telstra also successfully tested the new 200G per wavelength capabilities of Ciena’s WaveLogic 3 Extreme chipset using a link connecting Melbourne and Sydney. 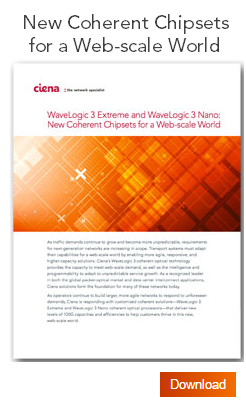 These feats were accomplished using Ciena’s 6500 Packet-Optical Platform, equipped with our WaveLogic 3 coherent chipset. Unveiled just a few months ago, WaveLogic 3 Extreme provides extreme performance for a variety of coherent networking applications, including the ability to transmit 200G wavelengths metro and regional distances using our next-generation 16QAM coherent modulation format. For more on today’s news you can read Ericsson’s press release.